This server has received 2229257 hits from both ipv4 and ipv6. The imminent end of the Internet as we know it approaches – our IPv4 addresses are running out fast. Less than 10% of the original 4 billion remain. Internet service providers will have to ration their stocks of existing address blocks and growth will become more difficult. The solution? 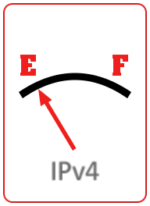 IPv6 addresses are plentiful and easy to obtain. The problem is that the transition is already years behind of schedule. Having completed internal testing and analysis, we’re delighted to announce that 2020Media will be rolling out IPv6 in 2010 to both hosting and broadband customers. Problems still exist though: For instance, at the time of writing, there are NO consumer broadband modems that support IPv6. And of the top 500 websites (tracked by Alexa), only 1 supports Ipv6. So even if you can get connected via IPv6, chances are you won’t be able to see any websites! 2020Media is participating in an ISOC project to map and present data on the takeup of IPv6 by the worlds leading websites and companies. More information on our plans. Previous Previous post: What is a QR Code?